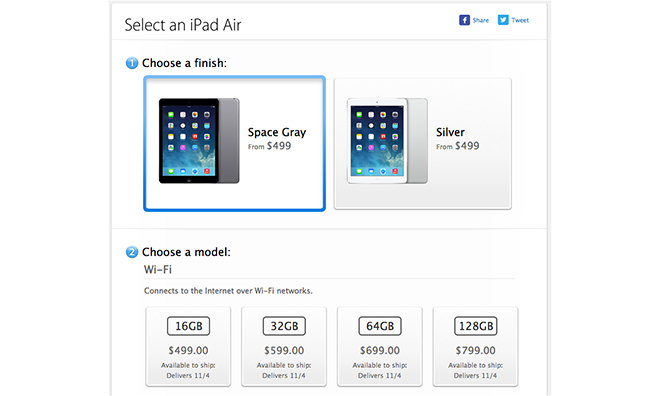 As expected, Apple kicked off sales of the new iPad Air on its U.S. online storefront a little after midnight Pacific time, with all models showing immediate availability for in-store pickup. The U.S. is the last timezone to be granted access to Apple's latest full-size iPad, with the tablet hitting Apple Store shelves in Australia some ten hours earlier. As reported on Monday, the company is allowing customers to place Personal Pickup orders, suggesting ample supply. As of this writing, the Online Apple Store is showing all models as in stock and ready for shipping with delivery by Nov. 4, though it is unclear how many units are allotted for the U.S. When the device launched in Hong Kong, it sold out in less than three hours. Apple's latest iPad Air features a redesign similar to the current iPad mini, with slim side bezels and curved edges. Along with the aesthetic changes, Apple managed to shave nearly half a pound from the previous generation iPad's weight, bringing the Air down to one pound. Powering the device is the latest A7 system on a chip, which is also found in the iPhone 5s. Unlike Apple's flagship handset, however, the iPad Air's silicon is clocked 100MHz faster and has been benchmarked as being nearly two times faster than the A6X-toting fourth-generation iPad. Reviews for the device have been largely positive, with many calling attention to the unit's light weight and speedy performance. Aside from ordering online, the iPad Air will also be available at brick-and-mortar Apple Stores starting at 8 a.m. local time. Prices start at $499 for a 16GB Wi-Fi model, then move up to $599 for a 32GB version, $699 for 64GB and $799 for 128GB. Apple is offering identical capacities with Wi-Fi + Cellular connectivity for an additional $130.